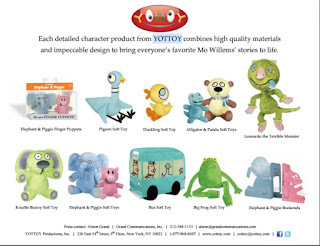 Welcome to TMG: The Art And Whimsy Of Mo Willems Exhibit And YOTTOY Toys! 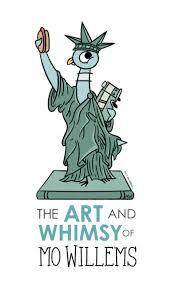 The Art And Whimsy Of Mo Willems Exhibit And YOTTOY Toys! I am so looking forward to this exhibit. Mo Willems literally filled our house for endless hours of laughter. We have watched our son scream "DON"T LET THE PIGEON DRIVE THE BUS" as well as read to us, all the adventures of Elephant and Piggie. This looks like a must see for any fan! I cannot wait to tell you all about it! Even more exciting is the exclusive toys that will be made available during the showcase! From the YOTTOY company has developed a beautiful line of toys and decor that every fan will absolutely love! "This spring, the New-York Historical Society will celebrate Mo Willems’ beloved children’s book characters, including bus-obsessed Pigeon, comedy duo Elephant and Piggie, and famed Brooklynites Trixie and Knuffle Bunny. On view March 18 through September 25, 2016, The Art and Whimsy of Mo Willems will follow a multifaceted journey across a career that started on Sesame Street and led to award-winning books like Don’t Let the Pigeon Drive the Bus! (2003). Through approximately 90 works, the New-York Historical Society’s unique presentation of the exhibition will highlight particular elements of Willems’ life and career in New York to show how the city influenced the creation of his iconic characters." This exhibition is organized by The Eric Carle Museum of Picture Book Art in Amherst, MA.